We produce and manufacture most of the visible wood components that go into our log homes. These include items such as the logs, siding, heavy timbers, 1x and 2x T&G and interior trim, etc. Some of the products that we partner with others to make for us include: exterior and interior coatings, windows, exterior and interior doors, roof covering, floor covering, imita- tion stone veneer, treated deck material, exterior trim and garage doors. Some of the less noticeable materials include, framing lumber, roof trusses, drywall, house wrap, underlayment, hardware, caulking, fasteners and insulation. Our goal is to manufacture the best quality log and timber home material possible. Although this is very important, we also put a lot of thought and research in finding the right products and partners/suppliers to supply the items we don’t make. De- pending on the quality of these components it can make a big difference in the performance of your log home. You as a home owner have invested far too much to jeopardize your home by taking short cuts using second-rate material. In this article we will address the various building components and our suppliers. My goal is to give the reader a fair overview of each item. There are many kinds of finishes available that can be used to put on your log home. However, this is one area that you simply can’t afford to second guess. Having a good quality coating applied on your home versus a mediocre one can make a huge difference in the maintenance of a log home. Remember that it takes the same amount of labor to apply a so- so finish as a good one! For years we have had potential exterior stain suppliers knocking on our door trying to talk us into pushing their product to our clients. Every one claimed to have the best. A few had life- time guarantees and one even claimed that their product would last forever. Finally, we decided to do our own testing. We bought about forty different products from thirty leading manufac- turers. We coated several pieces of log siding of each product and fastened them on a framework made especially for it. Finally, we set the frame with the test pieces out in a semi-shaded area. A very typical log home environment. After three years of exposure we took them off. Clearly, Proluxe’s, (formerly called Sik- kens) two coat system, Cetol Log and Siding, and the three-coat Cetol 2&3 plus outper- formed the rest. Not only did they perform better but it also looked better. Sikkens, with its Alkyd-oil formula gives the wood a luxurious quality appearance that other less expensive, such as Acrylic based products, can’t match. We had no bones in this test whatsoever. In other words, it didn’t matter which product performed the best. Our interest was to simply find the best transparent exterior coating available so that we could, with confidence, recommend that to our clients and include it in our packages. It is very important to us that our clients use the highest quality coatings on their log home. We want our customers to enjoy their log home, and the right coatings can greatly enhance that enjoyment because of less maintenance. In short, we want them to have the absolutely best log home living experience possible. All of the above would mean very little if its manufacturer, PPG, wasn’t a well-recognized, stable company. To you, our customer, it’s very important that they will be around for many years. Depending on what you use and if the manufacturer would go out of business, someone might end up having to remove it before a new product could be applied. No one needs that headache. Unfortunately, many applicators and/or builders often succeed in talking our clients into a lessor quality product. Contractors have three reasons to do that. First, they like to use a material that is easy to apply, such as a water-based product. Second, something that covers the defects better, which means it’s less translucent and also covers up the natural charac- teristics and grain of the wood. The very beauty you paid so much to have! And finally, a product that they have their own dealership for, which ultimately adds to their bottom line. All the above does not, in my mind, give you a better value. Your interior finishes, while important, aren’t nearly as important as the exterior. Any good brand backed by a good company will suffice. Again, in our pack- ages we use a PPG product called Cetol BL Interior, which is the same product that used to be called Log Decor by Sikkens. It is a simple product to use that has the stain and protec- tive finish in one, easy to clean up and low odor. Most other products you have to stain and wipe first and then follow with a clear coat. Whatever product you do use make sure that there is some color. Even just a little color will help to cut down on the UV damage – “yellowing of the wood.” While color does not eliminate this, it certainly helps. When clear is used, the sun is in con- trol. On the other hand, when color is applied you are in control. 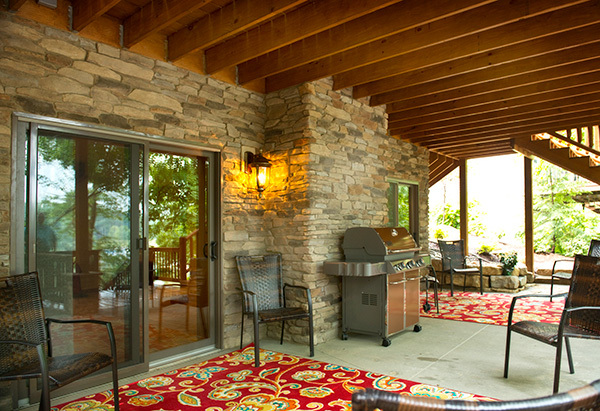 Nationally recognized, “Anderson Windows” is our window of choice. They make a variety of different window lines to fit any budget. We promote either their high-quality 400 Series or their Architectural Collection upscale E-series. The 400 series comes standard in our packages. It is a vinyl-clad, wood-framed win- dow with seven different color choices on the outside. On the inside, it comes with unfinished pine that you can finish to your liking. The E-series has a heavy, extruded aluminum-clad exterior with lots of color choices. On the inside, you have choices of at least ten different wood species, and if so desired, prefinished with various different shades and colors. This is a very heavy durable window that will last for ages. Hint, builders don’t like to install them, they are sooo... heavy! Both the E-series and the 400-series come with lots of possibilities. Optional win- dow types include double hung, casement, awning, gliding and stationary. Their sta- tionary windows come in various different sizes and shapes. Most window types come with true divide or simulated divide grilles and are available in various different pat- terns to suit your unique taste. Glass options include low-E glass, sun glass, patterned glass and art glass. Some other options include screen and hardware choices. Both of these series of windows, with the proper glazing, can meet and/or exceed energy star requirements in all climate zones throughout the US and Canada. Not only does Anderson Window make high-quality windows with many options, it’s also a very stable company. This year, 2018 marks their 115th birthday! They have a good solid warranty, nationwide service network. Anderson is still making parts for windows that were installed fifty and sixty years ago! They continue to grow not only through acquisitions but through product development as well. Truly, Anderson meets all the criteria for someone we want to partner with.